The Definitive Career Spanning Hits Collection 1976-2016 180-gram 4LP set! The Best Of Everything is the first career-spanning collection of all of Tom Petty's hits with The Heartbreakers, his solo work and Mudcrutch. The 38-track set also features two previously unreleased tracks: the poignant and autobiographical "For Real" and the collection's lead single—an alternate version of the title track, which restores a never-heard second verse to the song that was originally recorded for the Tom Petty & The Heartbreakers' 1985 album, Southern Accents. 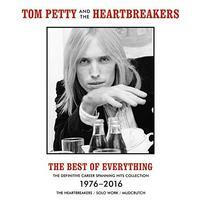 The Best of Everything collection also features an essay on Tom Petty written especially for this collection by Academy Award-winning screenwriter, director, author and journalist Cameron Crowe. The Best of Everything follows the previously released An American Treasure, a box set featuring unreleased music, live takes, alternate versions, rarities, and deep cuts. 7. Don't Do Me Like That – Tom Petty & The Heartbreakers? 8. Listen To Her Heart – Tom Petty & The Heartbreakers? 9. Breakdown – Tom Petty & The Heartbreakers? 1. The Waiting – Tom Petty & The Heartbreakers? 3. Southern Accents – Tom Petty & The Heartbreakers? 7. Refugee – Tom Petty & The Heartbreakers? 2. Learning To Fly – Tom Petty & The Heartbreakers? 2. Into The Great Wide Open – Tom Petty & The Heartbreakers?